It’s officially glowing skin time here at Healthy Smoothie HQ! I figured a good juice recipe for your skin would be a nice compliment to my most recent smoothie recipe, The Official Glowing Green Smoothie. Nothing brings out the glow in your skin like fresh juice. This recipe contains some of the most beneficial fruits and vegetables for healthy, supple, beautiful skin. Here are the ingredients with a brief description of how each promotes healthy, glowing skin. Cucumber: The juice of cucumbers is an excellent source of silica, known to improve your complexion and overall health of your skin. They’re also very hydrating with their high water content – properly hydrated skin being a must for glowing skin. Papaya: Like apples, papayas are rich in antioxidants, and contain the enzyme papain, known to cure skin impurities. Celery: Also very hydrating, celery contains a bevy of vitamins and minerals such as magnesium, chlorophyll, folic acid, and vitamin C, all of which are great for your skin. Lemon: Lemons promote beautiful skin primarily through their high vitamin C content. A glass of water with a little lemon juice and honey first thing in the morning is a great skin cleanser. Ginger: Rich in skin supporting antioxidants, vitamins, and minerals, ginger is also a potent anti-inflammatory, promoting smoothness and an evened skin tone. Note, you can use these topically as well to improve your skin or remove a blemish or age spot. Run a quick Google search for more information. Smoothies are a staple in my diet, but I like to mix it up once in a while with a little fresh juice. Occasionally I’ll use fresh juice instead of water, milk, or tea in my smoothies. For those looking to detox, a juice feast is worth exploring. The proportions in the this recipe render a nice tall glass of juice. Double up the ingredients for a larger juice and more skin glowing effects. Enjoy! Run all the ingredients through your juicer and mix well (I give my mason jar a good shake) after juicing if needed. Let me know what you think of this delicious super skin glow fresh juice by leaving a comment below. Happy Juicing! Hi Ryan, I have a question. 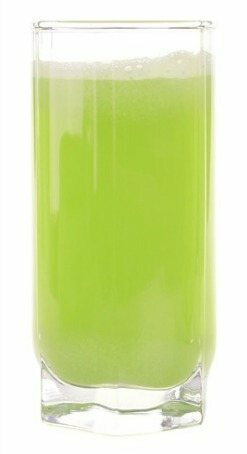 Is the Super Skin Glow Fresh juice Recipe only one serving? Also are all your smoothies only one serving? Thank you for sharing. Yes, the Super Skin Glow Fresh Juice is one serving. All of my recipes, smoothies and juices, are roughly one serving. I say roughly because serving sizes vary from person to person depending on age, activity, health goals, etc. I recommend adjusting my recipes based on your personal needs. Can water be added when blending? For this recipe you’ll want to use a juicer as opposed to a blender. Yes, water can be added. Hi what is best time to drink this juice?? Sometime in the morning on an empty stomach. The ingredients for this recipe should be put through a juicer, Valerie. Hey Ryan..can you please suggest me a smoothie to get a glowing skin. I am 27 yrs old, wght 52kgs and my height is 158 cms. Thank you. I’m currently shopping for a good juicer to purchase. What should I look for and how much should I plan on spending? That depends on a few things such as how often you plan on using it and what you want to juice. Do I use green or ripe papaya for this juice. Use a ripe papaya, Sharon.